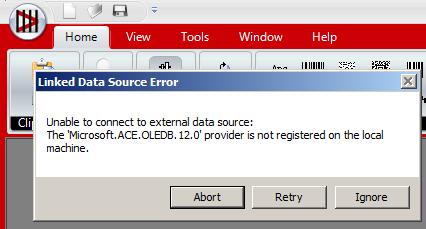 Error: Microsoft.ACE.OLEDB.12.0 provider is not registered on the local machine. Microsoft.ACE.OLEDB.12.0 provider is not registered on the local machine. NOTE: This issue may also occur with Crystal Reports, Access, Report Builder, SSRS or any other software that is linking to external data. Product: Barcode Label Software, Crystal Reports, Access, Report Builder, SSRS or any other software that is linking to external data. If neither solution works, open a ticket with Microsoft Support for another solution.